A nicely staged living room vignette. Photo by Flickr user Wonderlane. Are you thinking of selling your home? Is it already on the market but not selling as quickly as you would like? Your ‘stuff’ might be overwhelming buyers from seeing the house itself. As a real estate agent, I am sometimes surprised how people present their house to the market. It doesn’t need to be that way! With a few cheap and easy steps, you can transform your home into a house buyers can see themselves (and their stuff) in. 1. Clear out clutter. If it looks like you can’t fit all your stuff inside your house, then potential buyers will think they can’t either. Rent a storage unit if you have to for things you don’t use all the time (books, out-of-season clothing, spare dishes and linens). Or put stuff in the garage. Think of it this way- you’ll already be partially packed to move! 2. Remove personal photos. You want potential buyers to see the house as potentially theirs, not to feel like intruders. Clean off the front of the fridge. 3. Think of traffic flow. People need to be able to move through the house without tripping over too much furniture. That recliner might be super comfy, but if it’s in the way, consider moving it to storage. Think of walking from one room to another quickly. Do you have to avoid furniture? Then it’s in the way. At the same time, resist the urge to push all your furniture against the walls. It doesn’t make the room look bigger, just awkward. 4. Pops of color. It’s usually recommended for a house for sale to have an overall neutral color scheme, for buyers to see a ‘blank slate’. To avoid being too boring, a little bit of color can add some personality to a house without overwhelming the buyer. 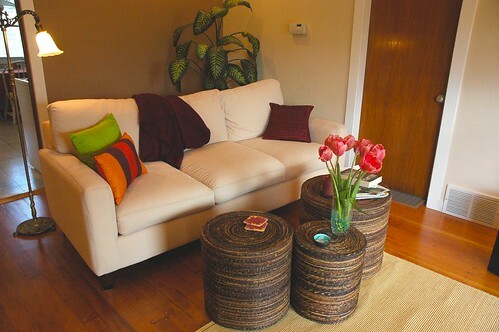 Throw pillows, houseplants, and flowers (plants can be fake if you can’t maintain them) are easy, cheap ways to do this. 5. Let the light shine in. Sunlight will illuminate your house and make it seem more open. Avoid dark or heavy curtains, remove dingy screens, and wash the windows. If there’s still not enough light, decorative mirrors can add light and make rooms seem bigger. Ta da! Your home is now looking more like a house for sale and ready to hand over to a buyer. P.S.- Are you in Western Washington and ready to sell your home? Call me for help getting your house on the market! Or email me at mariah@connectrealty.com!